1 Bedroom Flat For Sale in Stanmore, Middlesex for Asking Price £324,950. Now Available To View With Help To Buy Available. One of three 1-Bedroom apartments ideal for a First Time Buyer. The apartment is conveniently situated for all that Stanmore has to offer right on your doorstep. The apartment benefits from having its own private entrance, fully integrated Kitchen, fully tiled Bathroom and flooring throughout. - Kitchen with composite worktops & upstand with stainless steel bowls/drainers and mixer tap. 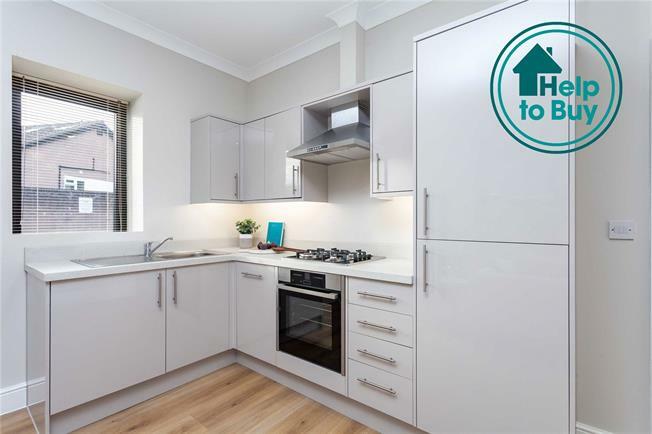 High gloss door finishes, integrated appliances - Fridge/Freezer, Dishwasher, Multi-function electric oven, Gas hob, Kitchen extractor with integrated lighting, Washer dryer. - Contemporary Bathroom with white sanitaryware, Porcelain wall and floor tiles, Stainless steel/chrome finished heated towel rail, White vitrified enamel wall mounted WC with soft close seat and dual push button flush. Mechanical extract ventilation. Thermostatic mixer shower. Designer taps and accessories. - Television (terrestrial and Satellite) and Telephone points. - High efficiency (SEDBUK) rated grade `A’ gas central heating and hot water system. - Bespoke built-in wardrobe to Bedroom. - Laminate wood flooring to Hallway and Living area. To arrange an appointment to view or further information, please contact Preston Bennett New Homes on 020 8954 8626.